This is one of those posts that probably won't interest too many of you, especially as I've blogged (not too well this year!) about many of these topics already... but this is more of a post for the books. For my memory. For my family... and especially for my daughter. Regardless, 2016 was good to us! It was less life-changing than 2015 was, but it did bring along a cross-country move and home-ownership for the first time. Each month was filled with many different events, and I want to remember as much as possible. In January, we took our first family vacation to Niagara Falls, Canada (with a stop at the Pro Football Hall of Fame in Canton, Ohio on the way) when Annabelle was four months old. In February, we had lots of visitors to our home in Ohio - my mom, followed by Lydia, followed by Michelle! 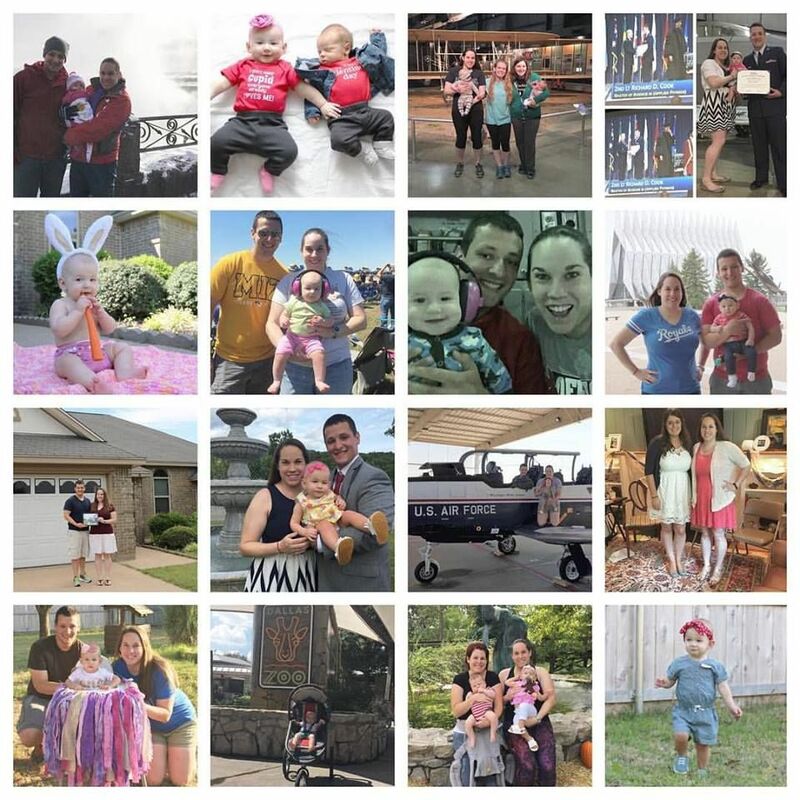 March brought Annabelle's half birthday, Dan graduating with his Master's in Applied Physics from AFIT, and saying goodbye to good friends in Ohio before moving to Texas. We stopped in Missouri to see family for Easter on our cross-country drive and got settled in Texas in April. Annabelle went to her first air show and (kind of) enjoyed it. We traveled to Oregon, Washington, Colorado, and New Mexico in May, and Annabelle got to go on her first six flights, including one Space A flight on a C-17. We visited family and friends on that trip and even took Annabelle to our favorite places from our years in Colorado Springs. At the end of the month, Dan and I celebrated two years of marriage. Exciting! In June, Dan promoted to 1st Lieutenant and started pilot training at ENJJPT, signifying the real beginning of our life in Texas. July was hot, and we spent a lot of time walking around our neighborhood in the mornings before it was unbearable. August was spent with a trip to Branson for a wedding and a trip to Kansas City for a bridal shower and bachelorette party. Dan flew his Dollar Ride in the T-6, and Annabelle and I went to the airfield to watch Dan fly his first solo in the T-6 - how fun! September brought our sweet and sassy Annabelle's first birthday, which was a blast, and a family trip to Dallas to take her to the zoo for the first time. That month ended with a trip to Kansas City so I could stand by one of my best friend's side as she became a wife, and then Annabelle and I visited another best friend in St. Louis so we could meet Baby Huxley! I also finished my exclusively pumping journey, which was a long but well worth it year-long extravaganza for me. In October, Annabelle and I returned from our road trip, and we celebrated her second Halloween by taking her to a Trunk-or-Treat event on base. November was busy with Dan flying long hours, hosting a giant Thanksgiving dinner, and just living life. December brought about Dan completing his training in the T-6 and traveling to Missouri for Christmas and New Years! What a wonderful year we had as a family. Here's to 2017 - hopefully it will be even better!